This is the first post in a new series that explores some of my research and adventures while writing Zombies Are Human (formerly named Feast of Weeds) series. When violence erupts in Corrina’s neighborhood, Corrina and Dylan must flee. But then Dylan is captured and when Corrina attempts a rescue, she’s infected with a virus that messes with her memories—like PTSD and seeing ghosts, all-in-one. Suddenly she can’t be sure what’s real and what’s the virus and whether she’s still human. Troubles ensue, betrayals mount, people die. Corrina will do anything to save Dylan, even kill. And that’s just Contamination (Zombies Are Human, Book One). I had so much fun writing this series. My characters in Zombies Are Human eventually spend a lot of time on their bicycles. When the world falls apart, vehicles choke the freeways, and neighborhoods burn, bicycles might just be the most reliable way to get out of town. I went on two road bike tours with my husband over the past year to get a feel for what my characters might go through on the trail. 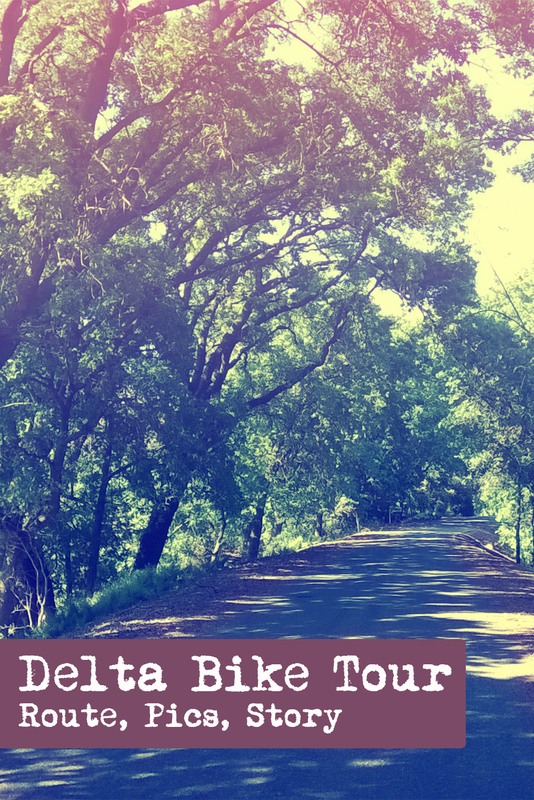 We started this first Delta Bike Tour in West Sacramento. We biked for two days; an out-and-back trip. The first day was about 55 miles, the second day was about 45 miles. We stayed the night in Rio Vista. I’ve included Google Maps of our route as well as some highlight pictures below. The posts in the rest of this series will share details about the route, the curious and beautiful sights along the way, and what all of that did to my imagination. Being on a bike, as in this case, allows you to stop and take a breather. I’m glad that when you did this, you took pictures. Which makes me wonder, did you take the breather because you needed to, or because something caught your eye? Either way, thanks for doing it. A little bit of both, of course :) Sometimes I had to stop because of a beautiful scene I wanted to try and capture. Other times it was a nice excuse for a break. I love this! Great pictures it makes the story more real. This information is awesome! I love the pictures!! Thanks for posting this! I love to hear about your process.